Over the years I've offered quite a few freebies on my website (and on the GeekMom and Wired websites as well!) This year I've been so swamped with work that I didn't have time to create a new project - so instead I'm compiling a list of my best Holiday freebies here for you. Enjoy! And please let me know if your family makes any of these crafts. Happy Holidays! Click here for the Zombies Versus Gingers Holiday Town. Click here for the printable gift tags. Zombies, Robots, Imperial Stormtrooper snowmen, and a geeky reindeer. Nutcracker Black and White version - Click Here. 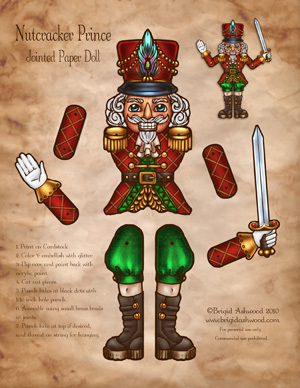 Nutcracker Full Color version - Click Here. Witchy Christmas Holiday Card - Click Here.